In Germany, David Hasselhoff is a superstar. In addition to being a BayWatch character, everyone watched him 20 yrs ago on a show called "Night Rider." It seems he can also sing, and believes himself to be part of the reason that the Berlin wall fell. And he sells fragrances here. His marketing: "I smell so good, who wouldn't want to smell like me?" Despite the many protests of my German friends that they do NOT like the "Hoff," it is still always one of the first questions that I'm asked when I meet new people. 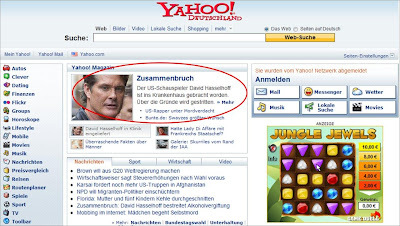 Understanding this, it should come as no surprise that he was on the front page of the German Yahoo! news today (see above). I still don't understand the love affair with everything "Hoff." But I find it very amusing. Could someone please explain to me this love affair?